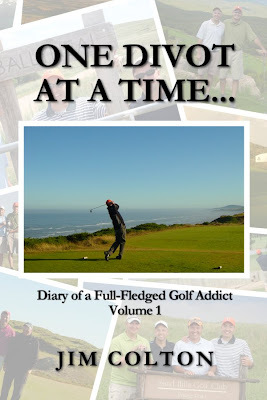 As I mention in my last post honoring my grandmother (please read if you haven't already), I have been working on putting together my blog excerpts and other golf stories into a book. 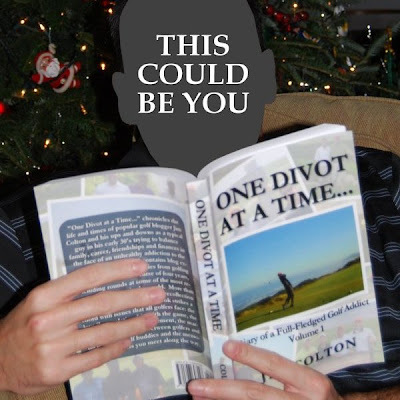 I am thrilled to announce that "One Divot at a Time... (Diary of a Full-Fledged Golf Addict, Volume 1)" has been published just in time for the holidays and is now available for $12.95 in paperback or only $1.99 on Kindle at amazon.com (look out Sarah Palin and Dan Brown, I'm gunnin' for you). I hope that at some point over the last four years, I've been able to strike a chord with you, my golfing brethren. If it's not abundant clear already, I love this great game. Probably a little too much (okay, way too much). I'm a full-fledged golf addict and there's not much I can do about it. But I'm pretty sure that I'm not the only one out there. If you've followed the blog, you'll enjoy recalling trips to Bandon Dunes, New Mexico, Northern Michigan and Colorado/Nebraska, all hopefully tieing in to common themes listed above. Plus there are new adventures and background information that never made it to the Internet (including one chapter that was "too hot for tv"). If this is your first time on this site, check out the Foreword by Jimbo excerpted below. It provides a lot of the context to the book and the inner-workings of our 20-year golf relationship. p.s. 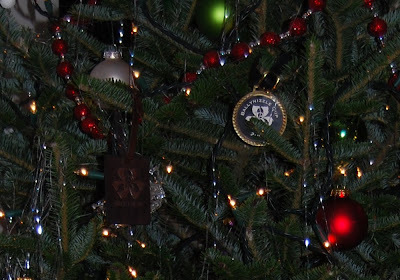 While we're on the subject of Christmas, if there's a list of Top 10 signs that you might be a golf addict, this has to be on the list: You use bag tags for Christmas ornaments. My brother Jeff, a.k.a. “Jefe”, and I had a theory. The last 40 feet of our driveway, just in front of the garage door, was made of concrete. The rest of the shared drive was blacktop, and it stretched up a hill a good 150 yards to the neighbor’s house. We noticed that when on roller skates the concrete slowed us down significantly, as opposed to the smooth blacktop. An important scientific question was then posed: if we climbed to the top of the hill and skated down the blacktop driveway, would the friction created by the 40 feet of concrete stop us before we smashed into our house? There was only one way to find out. Being the older brother by a year and a half, I went first, with Jefe launching himself not far behind. Halfway down the hill, I knew something was terribly wrong. I had never seen speeds like that in my short life. As I rounded the corner, I instinctively knew the concrete wouldn’t stop me. I flung myself off the blacktop and onto the lawn, narrowly avoiding a tree and wooden fence. I had aborted our scientific endeavor. Lying in the grass, I turned, fully expecting Jefe to take the same rational course of action. Like me, Jefe was moving at a blinding pace. Unlike me, he kept going. I watched, horrified by the spectacle, but also fascinated. What would happen to my kid brother? 1. Our “blacktop to concrete friction transference theory” had been proven, beyond a shadow of a doubt, to be false. 2. Jefe was a madman. 3. He had something I didn’t have. And so it went that way for much of our childhoods. I was willing to take risks, do crazy things, go to extremes, etc., but Jefe always went one step further. Especially when it came to golf. I loved, and still love, the game. As a kid, I played almost every day in the summers. But Jefe wanted to play all the time – rain, snow, sleet, freezing temps, early, late, any time of the year – it didn’t matter. The kid was beyond passionate about the game, much more so than I. We still played rounds together, but it was clear that Jefe needed someone more like him. He needed someone who was willing to skate full speed into a house without flinching. Enter Jimmy “Utter Butter” Colton. (If you ever see JC swing a club, you’ll know why I call him “Utter Butter”). Not surprisingly, in his mid-teens, Jefe got a job at a local mini-golf course named Stone Creek. There, he met Jim Colton, who also thought working at a putt-putt course was the pinnacle of life. And just like that, Jefe had met Robin to his Batman, Barney Rubble to his Fred Flintstone. Jim Colton was, in effect, the Jefe of Geneva. Or, perhaps, Jefe was the Jim Colton of St. Charles (at the time, Geneva was essentially a neighboring backwater town to St. Charles). The two clicked instantly. Jim Colton was the same age as Jefe, on the golf team like Jefe, played pick-up hoops like Jefe, and like Jefe, did everything at full speed always going one step beyond. He was, and is, a nut. Both were excellent golfers. Both are ultra-competitive. Both had an extreme dislike for, and a propensity for getting into trouble with, authority figures at golf courses. They had a mental list of everyone that had ever crossed them. They believed that Chili’s was fine dining, that Dairy Queen was perfectly acceptable for a first date and that golf was the very fabric that held the universe together. As expected, the two became best friends, thick as thieves. They hung out together, had bloodlust matches after closing at Stone Creek, and of course, played golf with one another anywhere and anytime. Golf meant playing anywhere from the local goat track to eventually some of the finest courses in the country. They took a road trip to Augusta National for a Masters practice round. They set up a makeshift driving range in the 10’x12’ dorm room they shared for two years at the University of Illinois. Eventually, each stood up in the other’s wedding and watched each other start families of their own. Just like Snoopy and Woodstock, the bond was unbreakable. Fast forward ten years. After an odyssey of my own which included time in Australia, the start of my career, and the beginning and end of a tumultuous six-year marriage, I returned to the duo of JC and Jefe. Not much had changed. They were still hypercompetitive, golf-crazed lunatics. However, it was no longer a duo. It was now a triumvirate. The Triumvirate. Golf trips ensued to places like Georgia, Alabama, and Michigan. Wisconsin, New Mexico and points beyond. While on these golf binges, Jim and Jefe had the innate ability to sniff out any DQ within a 20-mile radius. Without fail, we visited. There was also the uncomfortable nightly ritual of having to watch them climb into the same hotel bed. Undoubtedly, it was after a day of 36 holes where they lobbied for 18 more. It was clear I wasn’t like either of them. And I was more than okay with that. I quickly realized that I had become the voice of reason – the only sane mind in the room. When left to their own devices, this sort of behavior was acceptable. But today, approaching mid-life, they had different responsibilities: wives and kids, mortgages and burgeoning careers. I decided that it was my job to get these two guys back to Illinois in one piece. Someone needed to save them from themselves. It was around this time that Jim began to chronicle these events and experiences on his blog. He wanted to capture, if possible, the joys and frustrations that a life in golf inevitably fosters. He wanted to share the funny stories and the unique characters met along the way. Mostly, he wanted to explore the friendship of the Triumvirate through golf. These rough sketches eventually evolved into the handsome volume you now hold in your hands. Not long ago, Jim asked a group at Ballyneal to provide one word that best described him. Both Jefe and I were up first and instantly responded with “obsessive”. Having thought about that response for some time now, I realized I was wrong. A much better word, a word that truly captures what he is all about, is “passionate”. He is passionate about what matters to him: his wife and kids, his faith, his friends and golf. I trust that you’ll see that passion throughout these pages. I have no doubt that if Jefe and I had known Jim on that day from our childhood with the roller skates, he would have rolled right down that hill and seen it all the way through. That is just who he is.